Slice chicken into bite-sized strips or cut it into chunks. Season it right on the cutting board with the Yucatan Spice Mix. Heat olive oil in a medium skillet over medium-high heat. Add chicken, stirring occasionally, until cooked through, about 10 minutes. Remove to a paper-towel-lined plate and let cool. Chop or slice remaining avocado. Place 1 cup of arugula into each of 2 serving bowls. 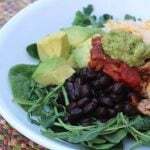 Add half of the chicken, avocado, beans, and cheese to each bowl. Top with salsa and Lime-Avocado Sauce. No Yucatan Spice Mix? Substitute a combination of chili powder, cumin, and garlic pepper. Don't like arugula? Skip it and use romaine or spinach.